I don’t care about Radiohead. I’m sorry to offend any superfans out there, but I just think they’re rehashing Dark Side of the Moon for my generation: music for people who want to like something “smart” but are afraid to really dig. 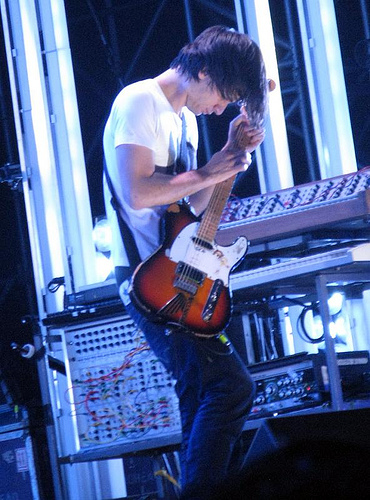 With that said, I like the bands guitar player, Jonny Greenwood. I began to realize this around 2007, when he put together a collection of his favorite reggae and dub songs for Trojan Records 4oth anniversary, for the fantastic compilation, Jonny Greenwood is the Controller. Then later that same year, Greenwood did the score for There Will Be Blood, which (among other things) got him a pretty sweet write up by Alex Ross in The New Yorker. I think 2007 can safely be considered the year I stopped thinking about Radiohead and learned to love their guitar player. Now, I’d like to let it be known that March, 2010 brings another big event in my love of Greenwood in the news that he will be writing music for an adaptation of Haruki Murakami’s Norwegian Wood.